Many Chester County residents are interested in raising chickens in their backyard areas for a variety of reasons including the desire for fresh eggs and a natural food source. This etool provides guidance to municipalities interested in allowing for and regulating backyard chickens in traditionally residential zoning districts. Noise: Chickens, and especially roosters, are vocal and can disturb neighbors. Roaming: Chickens will be destructive if allowed to roam. They will scratch and destroy flower beds and can cause traffic hazards if they enter roadways. Odors: Improper manure management can result in objectionable odors. Unsanitary conditions: Chicken manure can attract vermin and create vectors for disease transmission. Visual appearance: Chicken runs, coops and henhouses can be unsightly if not properly designed and maintained. Predation: Wild animals can attack and kill chickens, which have limited means of defense. This eTool will not address all of the potential conditions that may arise in the course of keeping animals. Chickens may still cause disturbances to neighbors despite the use of the reasonable precautions that are included here. A backyard chicken ordinance should be adopted as an element of the residential accessory use provisions in the municipal zoning ordinance. See the model ordinance available on this webpage. The characteristics of a good backyard chicken ordinance include the following elements. It recognizes the interest and popularity of chicken keeping in Chester County. The ordinance satisfies the needs of most groups, including those who have no interest in keeping chickens and may object to chickens in the neighborhood. It allows flexibility in unique situations. It allows input from the community during the creation of the ordinance. It takes into account the needs of the owner as well as the health of the flock. It is simple to understand and enforce. Most municipalities prohibit roosters, although hens can also be quite noisy. Some municipalities require owners to band the chickens’ legs, but this may not be practical. Slaughtering – should on-site slaughtering of chickens be regulated? If so, should it be permitted outdoors or should it only be conducted indoors? Chickens are not typically regulated as household pets and have different characteristics, so municipalities may need to review their definitions of household pets to exclude domesticated chickens. Municipalities distinguish henhouses and coops from chicken pens. Henhouses and coops are usually structures with solid walls and a roof, in which chickens typically remain during nighttime. Chicken pens are typically constructed of wire or mesh that provide access to the ground and provide chickens more freedom of movement. Chicken pens can improve the health of the flock. How have Chester County municipalities responded to “backyard chicken keeping”? Approximately eight municipalities have zoning ordinance regulations relating to the keeping of backyard chickens. Most require permits. 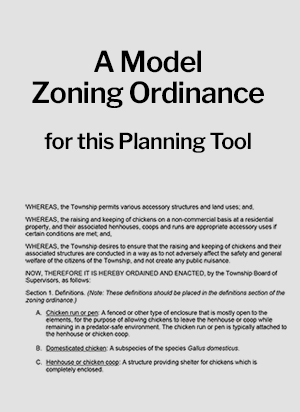 Minimum lot sizes are required, and municipalities limit the number of chickens per lot area. Many require between 1 to 5 acres, but others allow chickens on lots of less than 1 acre. Most municipalities have maximum limits on the number of chickens per lot, such as one chicken for each 1/4 acre, up to a maximum of 20 chickens. Setbacks from lot lines and adjacent residences are regulated, such as 100 feet to the nearest neighboring residence, and not less than 10 feet from all lot lines. Rear yard locations are generally required. Manure controls, such as routine removal schedules, are required. Most municipalities require a special exception approval for backyard chickens as an accessory use to a residence; few allow them “by-right”. Municipalities specify that the keeping of backyard chickens is not a commercial agricultural activity and is not a Concentrated Animal Operation, Concentrated Animal Feeding Operation, or normal farm activity as regulated under the Pennsylvania Act 38 “The Agriculture, Communities and Rural Environment Act of 2005” or ACRE (also known as the “Nutrient and Odor Management Act”). Backyard Poultry Info Sheet learn more about backyard chicken keeping in Chester County. BackyardChickens.com covers a full array of topics related to raising backyard chickens. Penn State Extension's Raising Fowl in Urban Areas discusses raising chickens in non-agricultural areas. Rodale’s Organic's How to Raise Chickens in a Tiny Yard discusses the consideration that go into deciding to raise backyard chickens and how to do it organically. The Humane Society of the Unites States includes cautions that should be considered before backyard chickens are kept.